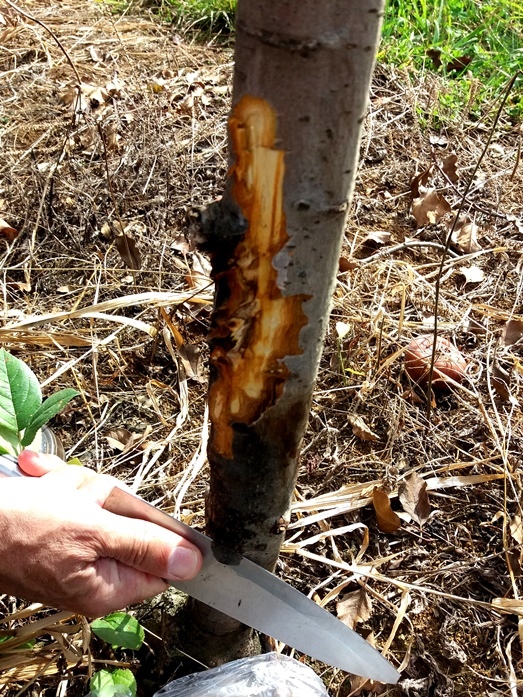 In March 2017, canker symptoms were observed in the branches and stems of several apple trees (Malus pumila) in an orchard located at the EPAGRI Experiment Station of Caçador in Santa Catarina State, Brazil (Fig. 1). Intense bacterial exudation from wounds caused by pruning, and colonisation and discoloration of the pith and conducting vessels, especially the xylem, was observed (Fig. 2). The leaves of affected trees wilted and ultimately trees died (Fig. 3). This report raised concerns because of the government's contingency plan to respond to the introduction of fire blight caused by Erwinia amylovora (Ministério da Agricultura, Pecuária e Abastecimento, 2016). A bacterium was isolated from affected plants. The isolated bacterium induced a hypersensitivity reaction in Nicotiana tabacum and Kalanchoe blossfeldiana 24 hours after inoculation. Isolated colonies were Gram and oxidase negative, catalase positive, facultatively anaerobic and formed white to cream colonies on nutrient dextrose agar. No fluorescent pigment was observed on King's B medium. The isolate fermented glucose, reduced nitrates to nitrites, grew at 39°C and macerated potato and carrot slices. The bacterial culture was stored in the IBSBF Culture Collection (WDCM 110) under the code IBSBF 3288. The biochemical and physiological tests indicated that the isolates belonged to Enterobacteriaceae. Lateral flow immunoassays (Ea Agristrip; Bioreba, Switzerland) and molecular detection with real-time PCR using the specific primers and probe hpEaF/ hpEaR and hpEaP (Gottsberger, 2010) for detection of E. amylovora were negative. Metabolic profiling (Biolog GEN III) of one sample of the bacterial suspension which was cultured on Biolog universal growth medium, indicated that the isolate had a high similarity to Pectobacterium carotovorum subsp. brasiliensis. However, PCR on DNA isolated from the bacterial suspension using primers Y1/Y2 (Darrasse et al., 1994) specific for Pectobacterium, was negative, whereas PCR with primers ADE1/ADE2 (Nassar et al., 1996) specific for Dickeya, was positive. 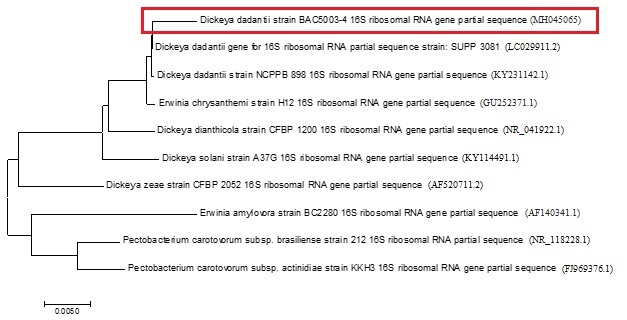 DNA sequencing of the PCR product (420 bp) for Dickeya spp. generated sequence of 329 bp (GenBank Accession No. MK391539) which had 99% identity with Dickeya dadantii (CP002038), covering 93% of the sequence. A PCR designed to amplify the V3-V4 region of the 16S rDNA resulted in a product of 1417 bp (MH045065). The PCR reaction conditions were at 95°C for 5min, followed by 40 cycles of 95°C for 15 s, 63°C for 30 s, 72°C for 90 s, and 72°C for 5 min. Comparison of our sequence with sequences in Genbank showed 99% identity with D. dadantii (LC029911) and synonymous Erwinia chrysanthemi (GU252371). Our isolate clustered with D. dadantii and E. chrysanthemi in a phylogenetic tree (Fig. 4). Real-time PCR with primers dadantiiF/dadantiiR and probe dadantiiP (van der Wolf et al., 2014), specific for D. dadantii, was positive, confirming the result of the 16S DNA region sequencing. Terminal branches of apple cvs. Royal Gala and Fuji Suprema cultivars were dipped in 100 ml of either sterilised distilled water (control) or a bacterial cell suspension (109 CFU ml/l). 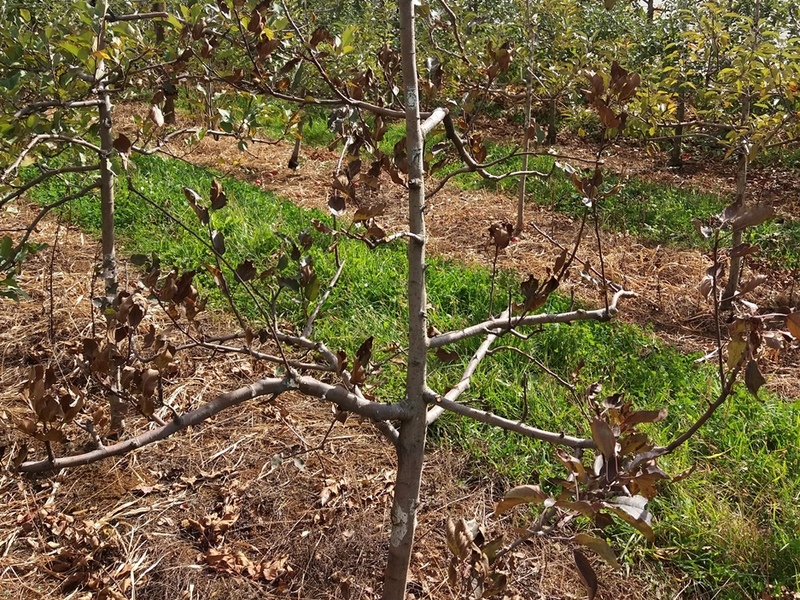 Five days after inoculation, terminal branches of both cultivars showed leaf necrosis followed by wilt and death. In addition, the vascular system of inoculated branches darkened (Fig. 5). No symptoms were observed in control plants (Fig. 5). The pathogen was re-isolated from symptomatic branches, fulfilling Koch's postulates. To our knowledge, this is the first report of D. dadantii causing disease in an apple tree in the world. Our proposal is that the disease should be called "Dickeya canker". 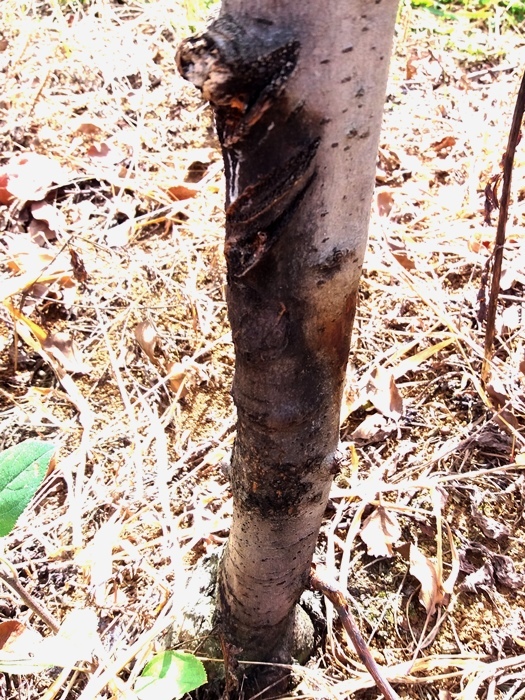 Figure 1: Canker symptoms caused by Dickeya dadantii in apple cv. SCS 416 - Kinkas. Figure 2: Internal and external stem browning symptoms caused by Dickeya dadantii in apple cv. SCS 416 - Kinkas. Figure 3: Dead apple tree (cv. SCS 416 - Kinkas) caused by Dickeya dadantii. Figure 4: Neighbour-joining phylogenetic tree of Dickeya dadantii BAC5003-4 isolate reconstructed from ITS sequences. Evolutionary distances computed using the maximum composite likelihood method using MEGA 7 software. Branch points from 10,000 replicates. Figure 5: Apple (cv. 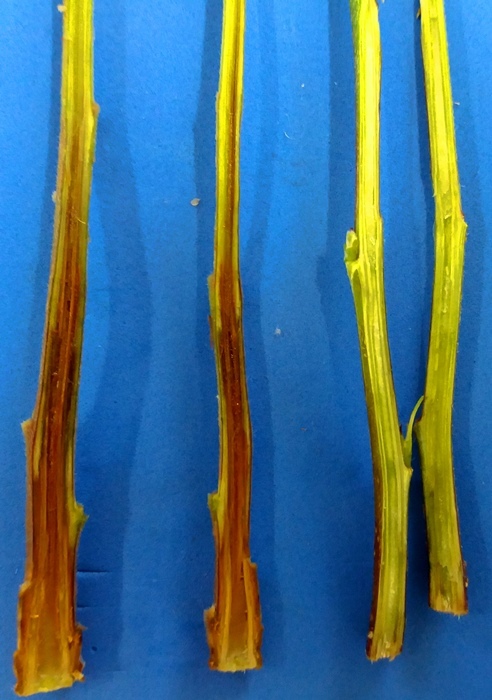 Fuji Suprema) branches five days after inoculation showing darkened vascular system of inoculated (left) and clear green tissue of non-inoculated plants (right). We are thankful to EPAGRI and to Valdecir Perazzoli, Daniela Alves Cardoso, Jonas Borba Pereira and Juliane Fernandes. Darrasse A, Priou S, Kotoujansky A, Bertheau Y, 1994. PCR and restriction fragment length polymorphism of a pel gene as a tool to identify Erwinia carotovora in relation to potato diseases. Applied and Environmental Microbiology , 1437-1443. Ministério da Agricultura, Pecuária e Abastecimento, 2016. Instrução Normativa No. 34, de 25 de agosto de 2016. http://www.agricultura.gov.br/assuntos/sanidade-animal-e-vegetal/sanidade-vegetal/arquivos-dpcp/INMAPAn3425.08.2016_PlanodecontingnciafogobacterianoErwiniaamylovora.pdf (Accessed 19 December 2018). Nassar A, A D, Lemattre M, Lemattre M, Kotoujansky A, Dervin C, Vedel R, Bertheau Y, 1996. Characterization of Erwinia chrysanthemi by pectinolytic isozyme polymorphism and restriction fragment length polymorphism analysis of PCR-ampliﬁed fragments of pel genes. Applied and Environmental Microbiology 62, 2228-2235.